The fast, furious and fearless L.A. Derby Dolls, Southern California’s premiere all-female, banked track roller derby league, rolls into summer with a much-anticipated re-match between the Sirens and reigning champions, the Tough Cookies. The two all-star heavy teams will face off for the first time since November’s nail-biting championship bout. Two thousand breathless derby fans hung onto the edge of their seats as the underdog Cookies claimed victory by only two points in the last jam. Now the Sirens are greasing their wheels and planning revenge. The 2007 champions’ new captains recently led their girls in blue to a close victory against freshman team, Varsity Brawlers. The officers will patrol the track again, anchored by three lightening-speed jammers: Kung Pow Tina, V. Lee and Mila Minute. Paired with crushing blockers, the Sirens form a fierce force on the banked track. The Cookies haven’t skated in a game since January, where they narrowly defeated the rejuvenated Fight Crew. Cookies captain Iron Maiven and co-captain Gori Spelling are eager to reclaim their dominance. The Cookies major crusher Krissy Krash, white-hot jammer Laguna Beyatch, and blockers Kelly Kaboom and LEGacy will show the Sirens their victory was no fluke. The action on the track will get your adrenaline pumping and the action on our live music stage will get your feet moving as the Tulsa Skull Swingers perform at halftime. Following anthem singers such as Monique Powell (formerly of Save Ferris) and John Doe (of X) will be Abby Travis. No Derby Dolls event would be complete without the unique Vendor Village, featuring hand-crafted art, jewelry and clothes, food from Garage Pizza and Hot Dog on a Stick and glorious beer from Tecate and Alex’s Bar. 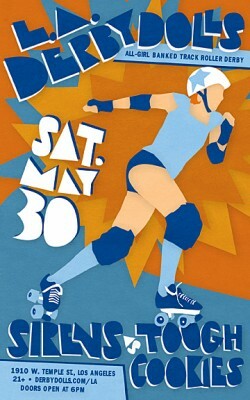 Be there and see all the action, May 30th. Get your tickets in advance, as these events SELL OUT.